Douglas J. Fryer is a member in Dykema’s Litigation Department and practices in the Firm’s Bloomfield Hills office. Mr. Fryer represents clients in a wide range of complex business, commercial and real estate litigation matters, including contract and commercial lease disputes, construction disputes, adverse possession, easement and other real estate disputes, and condemnation. He represents both plaintiffs and defendants at the trial and appellate levels of state and federal courts, as well as arbitration and other forms of alternative dispute resolution. He also has experience in administrative proceedings before the Michigan Tax Tribunal and the Michigan Public Service Commission. His clients range from small closely held companies to Fortune 500 companies. 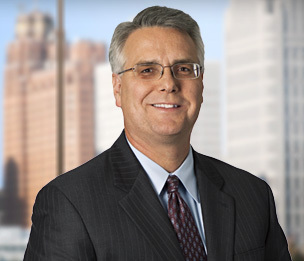 Mr. Fryer has extensive experience with eminent domain law, representing electric transmission companies in the acquisition of property interests necessary for the construction, operation and maintenance of new transmission facilities. He also assists clients in the planning and siting of new transmission infrastructure, including both administrative and state-court litigation. Mr. Fryer also focuses his practice on real and personal property tax appeals, representing both for-profit and nonprofit organizations. His experience includes commercial, industrial, and recreational real property appeals, as well as industrial personal property appeals. Secura Insurance v. Stainless Sales, Inc., 431 F.3d 987 (6th Cir. 2005). Upholding the United States District Court for the Eastern District of Michigan’s ruling that the plaintiff insurer had a duty to defend and indemnify the insured in the underlying suit arising from a train derailment. Matrix Construction, LLC v. Barton Malow Co., 2006 WL 399762 (Mich. App. 2006) (Docket No. 265156). Upholding the Wayne County Circuit Court’s ruling that plaintiff contractor failed to allege that defendant construction manager owed a duty to plaintiff separate and distinct from its contractual duties. Richard J. Gibbs, Jr., et al. v. Joseph C. Gibbs, et al., 2007 WL 838952 (Mich. App. 2007) (Docket No. 266718). Upholding the Macomb County Circuit Court’s order enforcing a settlement agreement. Burns Rolland, et al. v. International Transmission Company, 2008 WL 2038025 (Mich. App. 2008) (Docket No. 274411). Upholding the Lapeer County Circuit Court’s ruling that defendant electric transmission company’s plan to replace aging wooden utility poles with updated steel utility poles on the property of private homeowners did not violate the language of an express easement agreement. "Property Tax Exemption Guide for Nonprofit Organizations in Michigan"
"Bearing the Burden of Strict Scrutiny in the Wake of Simon & Schuster, Inc. v. Members of the New York State Crime Victims Board: A Constitutional Analysis of Michigan's 'Son of Sam' Law"
Further Appeals of Property-Classification Decisions Now Allowed!